These angling articles, some written specifically for Get Hooked, will help you get the most out of your fly fishing in the Westcountry. There is advice on tackle, bait and where to fish. Some are specific to particular areas, others more general. Even seasoned local anglers are sure to find some useful information among them. Not all are advice, some are humorous, others intend to inform on ecological and environmental issues. We are sure you will enjoy reading them. WHERE HAVE THE BLUE-WINGED OLIVES GONE? Read more about WHERE HAVE THE BLUE-WINGED OLIVES GONE? Bid on our incredible online lots! Co-founded by John Kelley and his son, Fergus Kelley, this is the second ever annual exhibition which will exclusively feature fly fishing, outdoor lifestyle brands and experiences in central London in the Business Design Centre, Islington​ N1 0PW. Doors open 9am to 9pm each day. Get Hooked look forward to attending the show again this year, we hope to see you there on the day. Rules, rules, rules. Theoretically, the Environment Agency is in favour of fishing – healthy outdoor sport, encourages respect for nature, spreads a tourist dollar or two, etcetera. But all its promotion is about fishing stocked ponds and lakes. When it comes to wild fishing, angling gets hobbled with so many restrictions it’s a wonder anybody bothers at all. South West Fishing For Life have started a new Fly Fishing group for breast cancer patients in North Devon. Gillian Payne who founded the group says its offers support and new friendships for ladies that have had breast cancer or lymph node surgery. 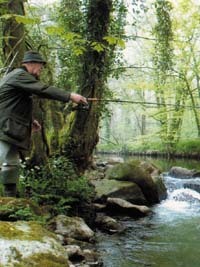 Fly fishing not only provides gentle relaxing exercise, but in this wonderful atmosphere, refreshes the soul as well. The group meet up every first Wednesday of the month 2-4pm at Blakewell Fisheries, Barnstaple, North Devon. No experience necessary. The Watersmeet and Glenthorne fishery on Exmoor’s River Lyn is to remain closed until the end of the 2013 season to safeguard salmon and sea trout stocks. The Environment Agency closed the fishery on July 12 following a higher than normal number of fish deaths due to disease. The action was taken to reduce stress on remaining fish and ensure as many as possible successfully spawn later this year. A similar outbreak occurred on the East Lyn in 2012. Symptoms shown by diseased fish include open lesions around the head and fungus on fins and other parts of the body. A detailed post mortem examination of a salmon carried out at the Agency’s National Fisheries Laboratory proved inconclusive. Starting with the basics of equipment, casting techniques, knots, fly selection, fishing techniques, playing and landing a fish. Also opportunity to fish in the afternoon. Price includes tuition, loan of all tackle and fishing permit..
All events are covered by an Environment Agency temporary rod licence so no need to purchase a separate licence. Not suitable for children under 13. Must be booked in advance.